White stylized Katakana character of A (ア) of Akita on wine red colour field which represent rapid progress of Akita. The prefecture emblem and the flag were adopted on Nov 3rd 1959 by Notice No. 380. The flag proportion is 7: 10. The hoist should be placed at right side. 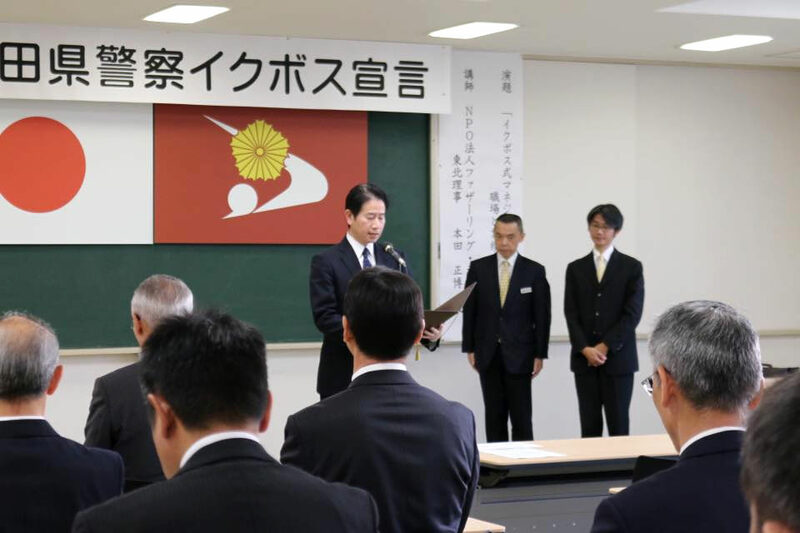 In a brief exchange with the Akita Prefecture Government Facebook page, ran by the Public Relations Department of Akita Prefecture, I was able to receive information about the colors of the prefecture flag. To quote their message to me on December 1st, "We usually use "CMYK" ,so don't know color code expressed by Munsell Color Code. CMYK is below: C:40 M:100 Y:70 K:10". 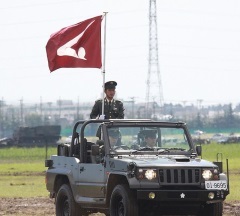 The first picture shows a flag with the Akita prefectural emblem shown normally (not reversed) on the side of the flag that has the hoist to the right. 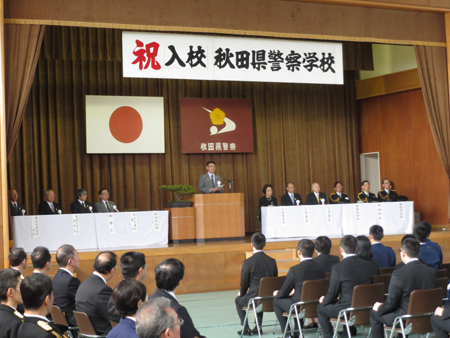 The kanji is in the top hoist of the flag, that is, above and to the right of the emblem. The second picture shows a flag with hoist to the left, and the emblem shown reversed. It's not clear whether there is any writing on the flag, but it could well be the other side of a flag like the one in the first picture. Both pictures are definitely evidence of the Akita emblem used on flags in a way that treats the sinister-hoisted side as the obverse. Ok, this sounds like a possibly confusing situation. Let's see if we can spell it out in more detail. Flag ground color: red brown"
Japanese - "二: つりひも つりひもは県旗の右側の上下につく。ただし、使用の態様によつては、この限りでない。"
English - "Two tying straps are attached to the upper and lower sides of the right side of the prefectural flag. However, this is not limited by the method of use." This is legal confirmation of the hoist on the right (dexter) side of the flag. It is very unusual for sure; I only recall Saudi Arabia having a flag with this effect in the terms of UN members. The second part is more for the hanging of the flag; many of times the flag will be flown horizontally. Also, Akita Prefecture Notice No. 380 allows for a different ratio flag, as long as the emblem size and position is kept intact. 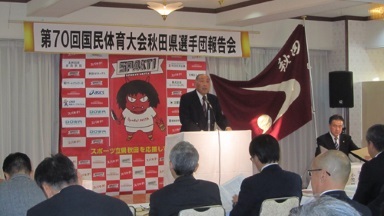 While it is not stated in the second notice (Akita Prefecture Notification No. 371), it is more of a supplement than anything else. 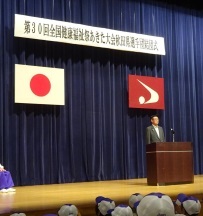 During a vocational competition in 2013, there was an opening ceremony that had all competitors carry their prefecture flags in. For Akita Prefecture, a variant of the prefecture flag was used. The same background color is used, however the prefecture symbol was made smaller and the kanji "Akita-Ken" is below the prefecture symbol. Both the symbol and text are in white. However, the hoist of the flag is where we would traditionally see it (viewer left) instead of the prefecture-legislated viewer's right for the hoist position. Here is the flag of the Akita Prefecture Police; it is the prefecture flag charged with the police emblem on the prefecture emblem. There is also a variant of the flag with text below the (smaller) emblem.